We got on board in Southampton. Would the person in cabin C520 please return to your cabin and close the balcony door. We are running into some heavy weather seas. I was seasick all the way from Southampton until we got to Gibraltar. Glad we went for an outside cabin. I like the first officer – very nice. You do get a bit fed up with three five course meals a day. Getting sick to death of deck quoits. Good job I don’t get seasick, much. Dolphins on the starboard bow. The modern day prison hulk. Non stop and one way to Australia. Are there any stowaways in the lifeboats I wonder? Just like in the movies. Don’t talk to me about the Titanic. Norwegian Fjords 7 nights full board from Just £679* per person. Sailing on over azure oceans, spend a day in Grenada with its waterfalls, rainforests, volcanic craters and beaches to die for – especially Grand Anse – just around the bay from St George’s, and you won’t be disappointed with lush St Vincent – fresh seafood, gentle calypso and unspoilt coves – it has an allure of its own. 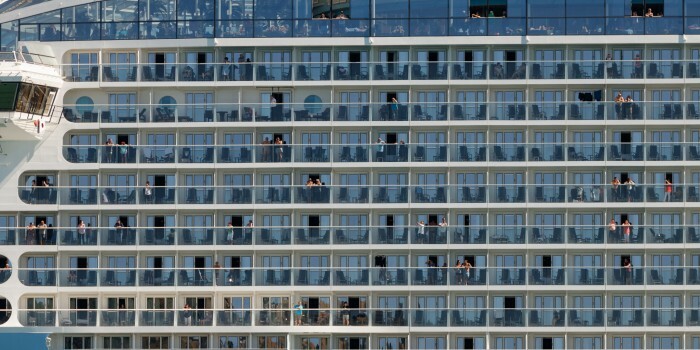 Could have sworn the guy on that balcony was naked. Just 15% deposit secures your booking. Step aboard the elegant flagship of our fleet and be captivated by her charm. why not try your hand at deck tennis, the golf net or the state of the art gym? I this Australia or New Zealand? It must have been about eight to nine years ago. At least seven anyway, because it was before the Chapel had been redeveloped and that was finished back in 2010. I was worship leading a service about something or other, and I used a picture of one of those eighteenth century Atlantic slave ships to make a point. This picture of a prison ship of the modern era took me straight back there. Funny how things link up in one’s mind and lead you down paths you might not expect (nor want to go down), the past jumping into the present, unbidden – a stream of consciousness, Mrs Dalloway moment. I do like today’s picture though. 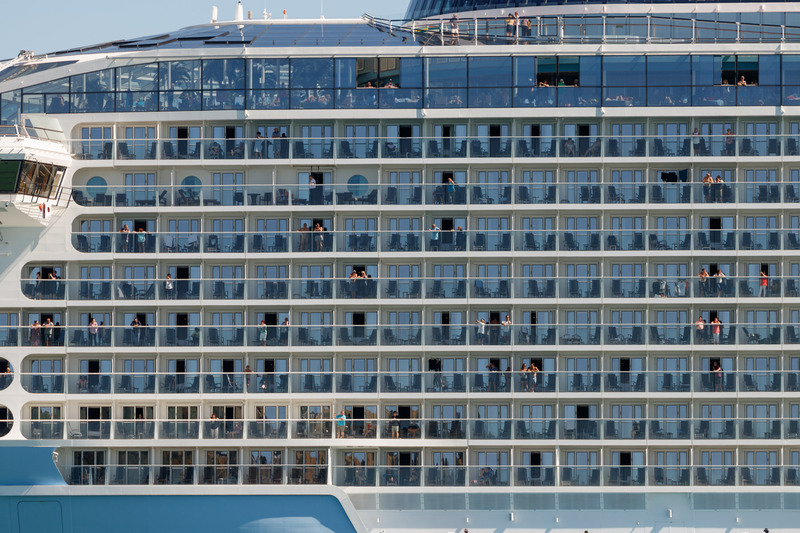 I mean, if you’ve got to be “locked up”, why not be locked up with a sea view, full board and decent wi-fi? Hopping from port to port, “Only one more sleep to Venice!”, the Captain’s table, full English every day. The weather looks good too. But even the Med gets rough, it’s not the mill pond some people mistakenly think. Ask the boat people. And as for the Bay of Biscay, don’t even get me started. But if the weather’s too bad for outside, there’s always the entertainment or the bar. Or both. Some go for the all-inclusive package including booze. They been on scores of cruises, maybe hundreds. HUNDREDS! They love the whole thing though, the vibe, the new people, the food, the isolation from the grunge of “ordinary” life. You’d have to be sociable, though, you really would. And I don’t suppose a domestic’s much fun. Back to the bar to cool off maybe. Sleep must be good though, and a calm relief from the rigours of the day – physical (the pool), mental (the crossword), gastronomic (unending). The hum of the engines drowning out next door’s shenanigans. The gentle rock, no hint of anything to get too worried about. “They don’t get icebergs in the Med, do they?”. The thought of tomorrow’s breakfast and a stroll up the Rock of Gibraltar, fighting off the baboons trying to nick your mid-morning croissant. I wish I could remember the theological point I was making way back then, as worship leader. It would have been something about injustice and Christ’s teachings and how sad He’d be if He was around now. I do remember the picture I used then though, to illustrate the point, whatever it was. I’ll never forget it. Very different from today’s picture. Row upon row of decks, bunks and bodies, forced migration, cheek by jowl, suffering, death and disease. A few in the congregation wept and I was close to tears myself, having to catch myself every now and again, and “pull myself together” so I could continue. Hymns sung with a lump in the throat, prayers heartfelt, the collection plate bulging. I’d like to say we have moved on, and in a sense we have. At least we know it’s wrong now. Most of us do anyway. Unlike back then. Posted on February 12th, by funkypancake in fusion.